Many materials, especially household hazardous waste, should NOT be poured down the drain, either to a septic tank or field or to wastewater treatment plants. These chemicals are toxic, and will kill the organisms that break down waste. These chemicals are not broken down in such systems and will enter surface and groundwater supplies. Flushing prescription drugs down the toilet should also be avoided as these have been shown to negatively affect aquatic life including fish and amphibians. 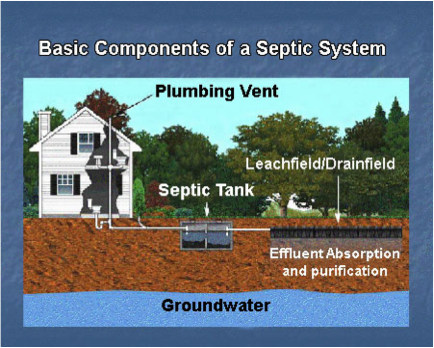 Residential and commercial septic systems generally consist of an underground tank that collects wastewater. Within the tank, organisms digest organic matter and solids can sink to the bottom. Periodically this tank should be pumped to remove all of the accumulated solids, also known as sludge or biosolids. The partially treated effluent then goes to a drain field, usually consisting of a series of pipes, also underground. The effluent runs into the soil where organisms can further break down materials and where the fluid can be dispersed. If working properly, harmful organisms and organic matter will be removed in the soil and the water will discharge to the groundwater. Groundwater can make its way to wetlands and streams and is a source of drinking water from wells. The EPA provides information on septic system management at https://www.epa.gov/septic. At wastewater treatment plants, such as those in Bennington, Manchester, and Pownal, materials are screened and allowed to settle in a sedimentation tank, resulting in sludge or biosolids. 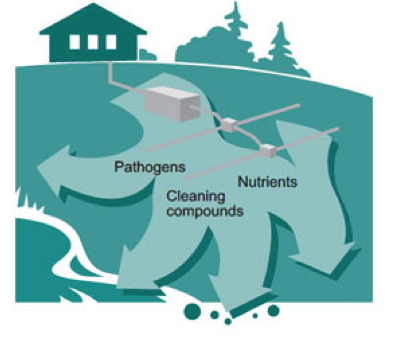 This process, called “Primary Treatment,” removes a large proportion of organic matter. The liquid effluent may then be filtered and/or run through activated sludge where bacteria can further digest materials. This may involve aeration to facilitate these biological processes. Again, there may be residual biosolids. Chlorination, filtration, carbon absorption and other means may be used to further treat the effluent to reduce pathogens, chemicals, heavy metals and other materials. Generally, the treated effluent is discharged into surface waters once it has been treated to design standards. Biosolids may need to be disposed on landfills. However, if wastewater is treated properly the resulting biosolids can be used to enhance soil nutrients and water holding capacity and reduce soil erosion. Land application of biosolids has been recognized as a potentially beneficial use in Vermont. See this publication from VT ANR for more information. We all need fresh water and we need to avoid overtaxing the systems that clean or at least partially clean our wastewater.